The Batavia Park District was wonderful to work with. I choose this location due to the low cost, but beautiful/unique architecture inside. I also like that I could choose my own food vendors, and provide my own alcohol. It saved me thousands of $$. I had between 225-260 (we had 65 last minute RSVP'S), and although it was tight, it was great. We chose to do a sweetheart table, and use the stage for the food, bar, and DJ. The security was great. I also chose this venue, because I could rent the Gym for the kids to go to after dinner if the parents chose. I am glad that I did. I think weddings with kids can be fun, but not for the parents when they are bored and ready to go home. I hired sitters to keep an eye on them. It was a great decision. Instead of kids running around everywhere, or just sitting bored at their individual tables, the kids were all making new friends and playing in the gym together. Everything was perfect. They were more than accommodating when the rentals place was running late in setting up, and during clean-up. The had most of the table and chairs needed, and the kitchen was included in the rental. Even having to pay for set-up tear down time, it was still much cheaper than any other location I was able to find. Thank you for the detailed review! We always enjoy hearing how couples feel about their rentals. Best wishes! From weeknight rehearsal to setup of decorations, we had the space without any interruptions. When the day of our ceremony came, staff was there to open the doors for the earliest arrivals and everything went well. The venue itself is beautiful and sound was easy to hook up without a hired audio person (though many of our party were skilled in a/v). People still tell us almost a year after our ceremony how beautiful the church/space was and that it was one of the nicest ceremonies. The price was ideal for our DIY wedding and I couldn't have asked for a better day. Special thanks to Becca who helped us book our reservations. Thank you for taking the time to review us. I am happy to hear that everything went well during your rental with us! Best wishes to you both! Thank you for your kind words! We appreciate you taking the time to review us! We wish you all the best! The value for Shannon Hall is amazing! Thank you for having your special day at our location! Congratulations to you both!! 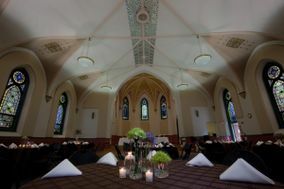 Shannon Hall is a great place for a wedding! It is stunning inside! I had my wedding at Shannon Hall back in September and it all went well. We had about 170 guests and we still had room for a dance floor. The price was very affordable. Only downfall (which we already knew about before seeing the hall) is that you have to set up and take down/clean the hall. We hired 3 people to clean plus my family helped as well. We were able to set up the day before for two hours (extra charge) as well. It was a little bit of hassle setting up and also having to clean up but it was definitely worth the amount of money we paid for 7 hours. Liquor is allowed in the hall and we had our reception catered since they do not provide food. Very beautiful place. We appreciate you taking the time to review us! Best wishes to you and your spouse! The facility was exactly what we wanted for our ceremony and reception. It allowed us to marry, dine and square dance in the same place. Shannon Hall is a beautiful (and economical) site if you don't mind doing a little work yourself. Thank you for taking the time to review us! We appreciate your kind words and wish you all the best! The venue is perfect for a wedding/reception. Just make sure that the sound system is turned on. That apparently wasn't done in our case. Thank you for taking the time to review us. I apologize for any inconvenience there was with the sound system. Best wishes!